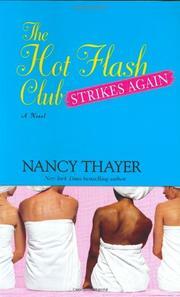 Thayer picks up where she left off with The Hot Flash Club (2003), introducing a new batch of women who band together to solve one another’s in-law problems. The meeting of like minds takes place at the Hot Spot Spa run by the postmenopausal ladies who formed the original club and who, sensing common needs, throw the new girls together in the hot tub. Intellectual graduate student Beth, 26, is finding it hard to adjust to fiancé Sonny’s blue-collar jock family, particularly because his hateful mother plots against her. Slightly older Julia, a special-events video-maker, has recently married Tim, a gentle widower whose daughter has not spoken since her mother’s death. Julia adores little Belinda; the problem is Belinda’s maternal grandmother, who resents the new wife for taking her dead daughter’s place. Slightly up the age ladder, 37-year-old Carolyn is pregnant and worried about her blood pressure, which is not helped by her executive position at her family’s multimillion-dollar paper mill. She and loving husband Hank, an environmentalist, share the family manse with Carolyn’s widowed father. They live companionably in separate wings until Dad comes home with a new young wife, whom Carolyn quickly senses is not as innocent as she seems. Oldest is Polly, a widow whose hippie daughter-in-law won’t let her visit her new grandson because she might bring germs from her former mother-in-law, a lonely snob entering the last stages of cancer who demands Polly’s slavish care. After brief catch-up appearances by the founding Hot Flash gals, the new characters commiserate and plot against their bad relations. With Julia’s help, Beth catches her mother-in-law-to-be’s villainy on tape and blackmails her into submission. Julia’s stepdaughter finally speaks, bringing her family together. Helping Carolyn expose her stepmother as a con artist, Polly and her mother-in-law bond. And eventually Polly gets to see her grandson. A tepid read, with cardboard characters and contrived situations.